Lazy Robot: HDR: What it is, and what it isn't. HDR: What it is, and what it isn't. I've recently been in a very strange discussion about what does and what does not constitute HDR imaging. It was strange because the definition used by the other party in no way took note of what HDR actually stands for. Thought I'd knock together a quick post to detail what is, and what isn't, HDR. HDR stands for High Dynamic Range. The dynamic range of an image is the difference in luminance between the brightest and darkest parts of the image. 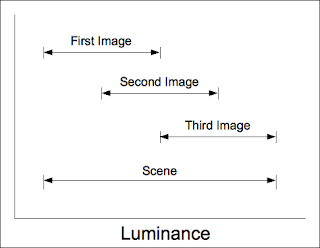 The luminance range is referred to in EV (Exposure Values) which are equal, in photography terms, to one F stop of aperture, doubling or halving the shutter speed, or doubling or halving the ISO value. In order words, increasing or decreasing by 1EV is the same as doubling or halving the amount of light. Many cameras now support a dynamic range of 11 EV. That is, the difference in brightness between the darkest and brightest things the camera can "see" works out as 211 times as much light. Anything too dark for a particular exposure is turned black, and anything too bright for a particular exposure is turned white. This is why, when photographing objects on the ground, the sky often turns white (blown out). And conversely, when taking a picture of the sky, the ground often turns black (blocked out). The difference between the two (the dynamic range) of the scene is too great for the camera to be able to see both. This often doesn't make sense to people because they can see both just fine with their eyes. 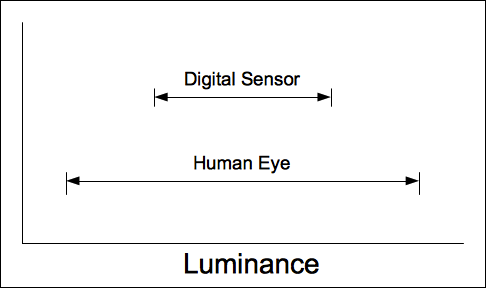 That's because, with current technology, the human eye can detect a higher dynamic range than a decent sensor (about 14EV), and even more after post-processing carried out in the brain (21EV). There are limits, though. Try driving toward a setting sun and also reading the speedo. Can't be done, because the difference between the bright sun and the dark dashboard is too great for your eyes. Cameras simply hit that limit sooner. The confusion has crept in because, in many people's minds, especially those who have only just learned the term, HDR refers to the technique, not the end result. In other words, doing certain things in Photoshop make the image "HDR" even if the dynamic range is not altered. 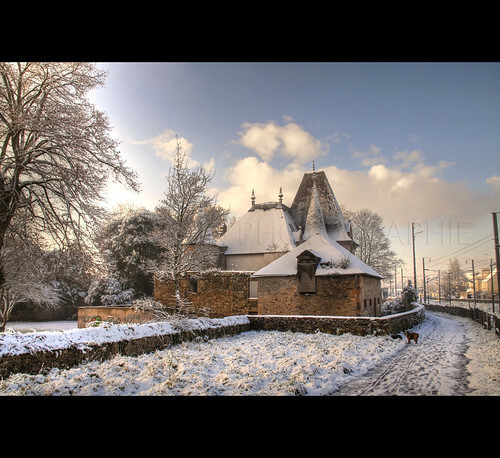 Normally, a high dynamic range image is created by taking multiple images and squishing them together to take the properly exposed parts of each. 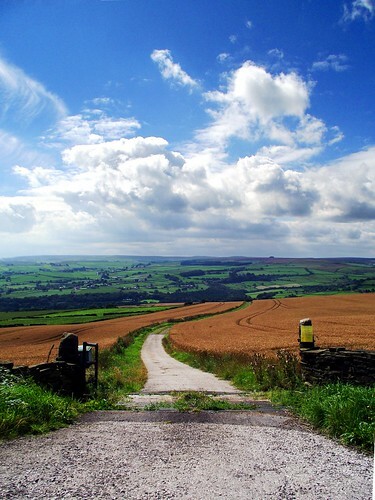 Consider a scene that the human eye can see properly, such as a landscape on a summer's day, that the camera struggles with. By bracketing exposures (taking 3 or more images, with a "middle" image, and one or more under- and over-exposed image) the full range can be captured. Contrast reduction is done all the time by display equipment, because the range of luminance they can display is often lower than the range of luminance stored in any given image. The technique of using a 14 bit RAW file and reducing contrast to avoid clipping the brightest and darkest parts can result in flat, dull looking images. Other techniques are required to restore the vibrancy of the image. Tone mapping is perhaps the most versatile. It allows as many exposures as required to get the range required, with multiple intermediate exposures, and can product great results. This one, for example, is not obviously tone mapped. However, the tendency is to go too far. To make the effect too extreme, at which point it loses all subtlety. Then you get things like this. Bright halos around objects, over-saturation, and a garish, cartoonish look to the image. Nasty, yes? Brightness mapping is a nice way to create HDR images but, like contrast reduction, it tends toward making very flat, low contrast pictures. They don't pop the way tone mapped images can. They can look very dull. Exposure blending (as demonstrated by my picture earlier) is the simplest method. Take two exposures, remove the blown out bits of one, the blocked out bits of the other, and put the two together. There are a multitude of methods from a simple gradient filter (similar to using an ND Grad filter stuck to the front of the lens) through to carefully picking each and every part manually. This can be time consuming, although the results are often excellent. But the point is that, no matter which way you choose to do it, it's the end result that is an HDR image. The techniques involved all have their own names, and a multitude of uses. The problem, I think, is education. People don't know that tone mapping, brightness mapping and exposure blending can do other things beyond the faddish HDR nonsense currently abound on the Internet. They assume that if a particular technique is used, then the result must be HDR, whether or not the dynamic range of the resulting image is greater than that of the constituent parts. HDR is a loose and flimsy term. It only applies when multiple exposures have been used to extend the dynamic range that the technology is capable of capturing or displaying. As technology improves, what used to be HDR is now normal because the capability of the sensors and displays have improved. Unfortunately, the loose and flimsy nature of the term means that marketing types can have their wicked way with it. In much the same as products are now marketed as "HD" since the advent of high definition television. It's another relative term which, when you think about it, has little or no meaning whatsoever. 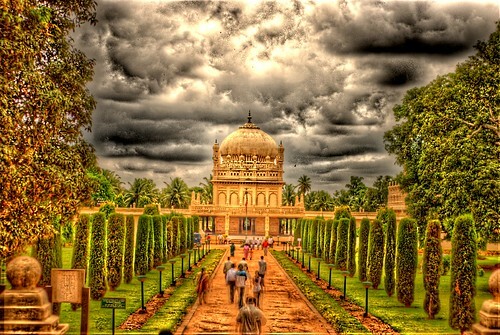 This is the fate suffered by the term HDR. It used to be an initialism used to describe images with a particular set of characteristics. Now its been chewed up, simplified, modified, mutated and spat out and means precisely nothing. Products with HDR in the name are now widely available that have absolutely nothing to do with increasing dynamic range in pictures. They are almost universally image editing products, with HDR slapped on the end to make them more appealing to the hip-set who don't want the hassle of actually considering the post-production work on their photos. They want their HDR prepackaged, downloaded and fully automatic. Even if they never know what HDR means.